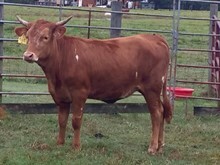 Big horned young cow with Working Woman genetics on the bottom and Delta Van Horn on the top. Dixie Chic should mature in the mid 80's with over 100 inches of total horn, we like those numbers. She is in our embryo donor program and we are expecting a Hubbell's 20 Gauge heifer calf in early November 2017, should be colorful with big time horn potential. A.I.ed to Bandera Chex on 04/24/017, did not observe heat at 21 days. Artificial Insemination Bandera Chex 04/24/2017 Did not observe heat at 21 days.